Facing/lining. 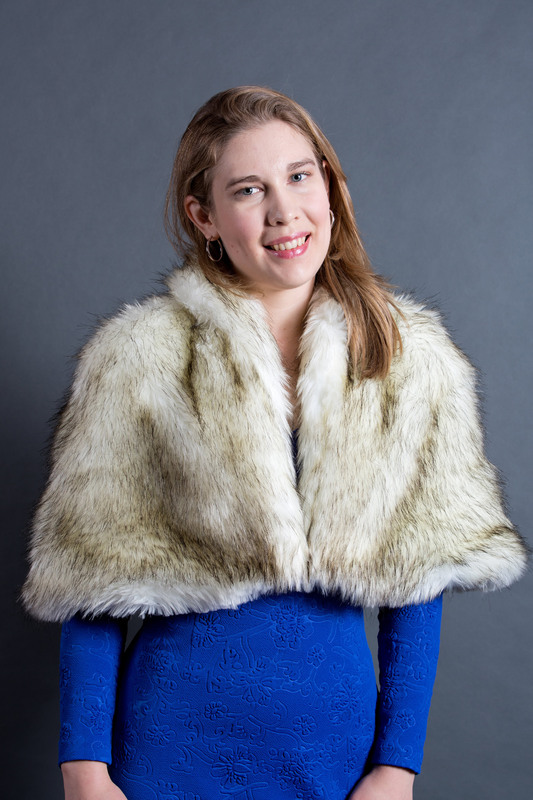 To keep the layers from shifting the lining is tacked to the collar seam at the shoulders and center back. 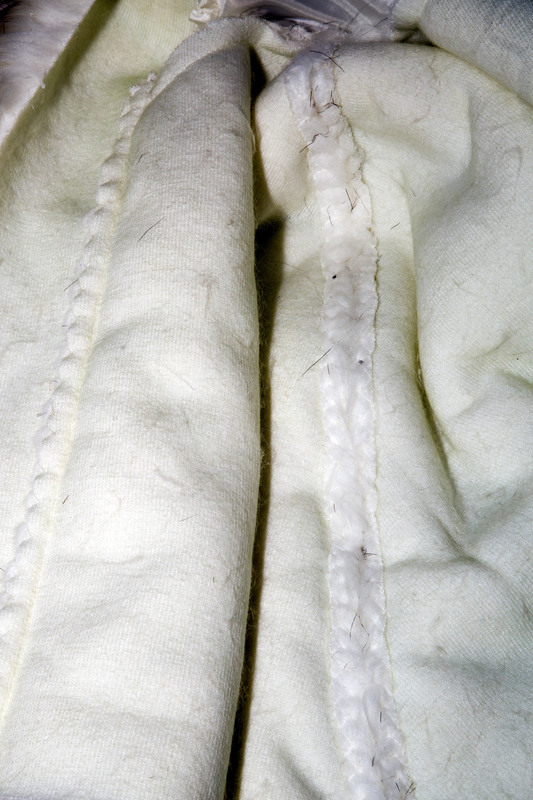 Undercollar – notice how it is lining rather than self fabric. More about that below. The Greta cape is a cropped collared cape. It hits at about waist level and fastens at the center front with hooks and eyes. (I used white fur hooks from Cleaner’s Supply.) There’s a single facing piece seamed at the center back, which acts as both a front facing and collar. You may have noticed in one of my photos that the undercollar is cut out of lining rather than self fabric. This was recommended by Style Arc in their instructions if you’re using fur. The collar rolls nicely, and the lining doesn’t show at all. I’m wearing it with my Cleo dress. 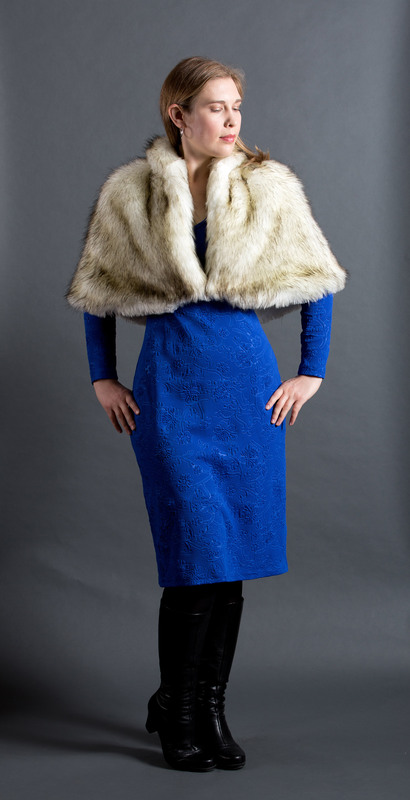 I love how the bulkiness of the cape contrasts with the slimness of the dress – it makes my waist seem tiny. Take note, fellow pears! I made this to wear to a wedding I’m attending this weekend. It is being held at a farm, and the ceremony will be outside in a field, on a hill, during late afternoon. So far the forecast for Saturday is a high of 57F/14C. The invitation stated “wear sturdy shoes and bring layers” and “ceremony will be outdoors rain or shine!” That’s why I decided to pair this cape with a long-sleeve dress and boots. 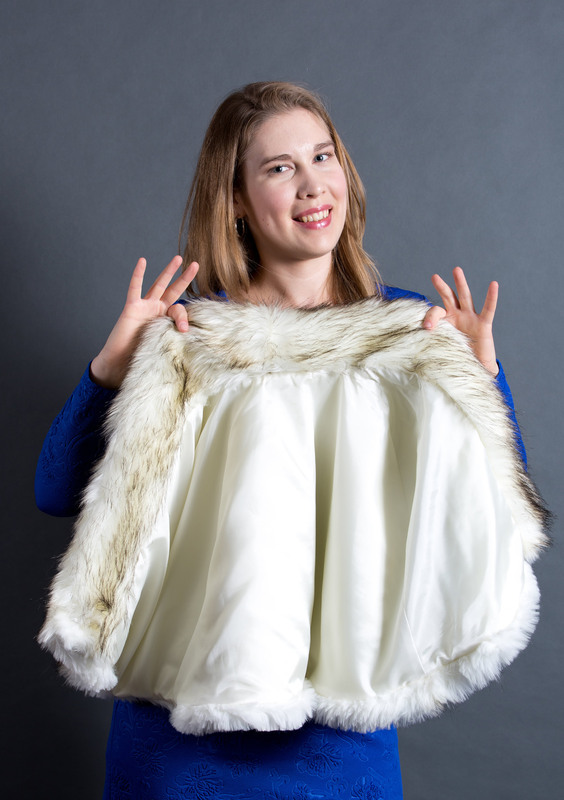 The fabric I used was a faux Siberian husky fur from my stash, purchased a couple years ago from Fabric.com. 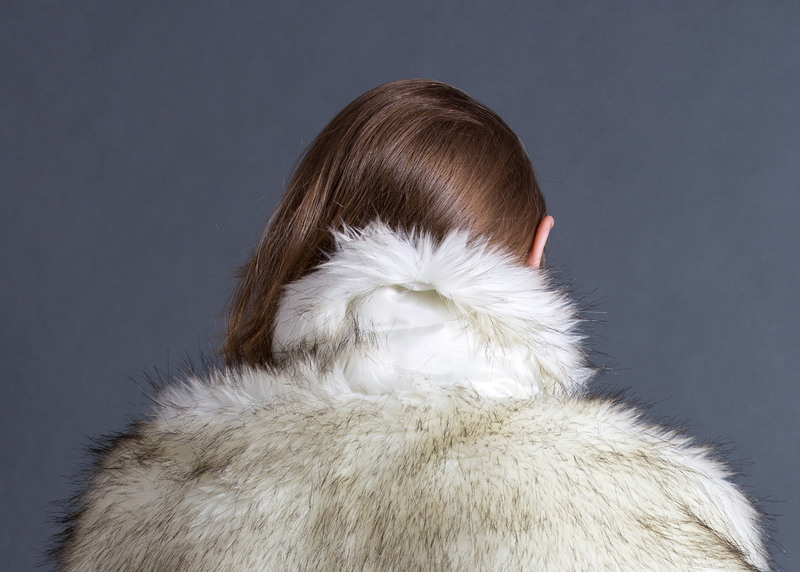 The quality is great – very soft, without that cheap look or plasticky feel that makes me shudder at most faux furs. There’s still a few yards in stock. I lined it with some off-white polyester lining from my stash. I think it was an old JoAnn’s purchase. 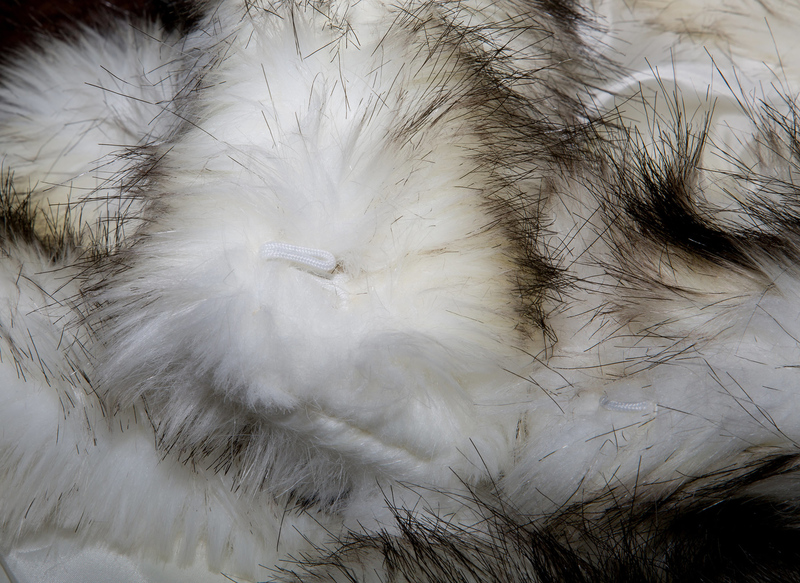 If you’re like me and have never worked with faux fur before, do not pick a long pile fur like this for your first fur sewing project. Right after I cut each piece out (with my Gingher shears instead of my usual 28mm rotary cutter) I shook it outside to get rid of the worst of the loose fur. Despite vacuuming ASAP after cutting I’m still finding random chunks of fur here and there. 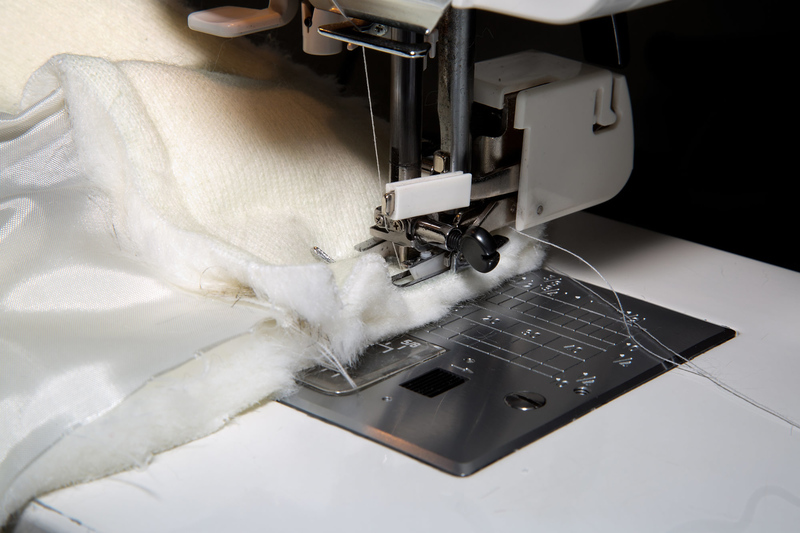 And while my Janome 6500P went through all of the layers fairly easily, it was just really thick and shifty and bits of fur kept obstructing my view of the seam allowances. I used my walking foot to help with the unevenness, but as you can see below the needle was almost bottoming out. I used a long stitch length (about 4.5) and sewed at the slowest speed possible on my machine. Since this fabric was impossible to press, I catchstitched the seam allowances of the side seams and facing in place to minimize bulk, finger-pressing them as I went along. This was the most time-consuming part of the project. I finished about 75% of this step at work during my lunch break (and more later on when I was stumped on a programming problem). When I was cutting the hemline, one of my cats distracted me and I chopped the upper layer of the fur instead of snipping just the “undercoat”. So I ended up cutting it all around so it would match. I am not the biggest fan of the choppiness of the hem. I really should have allowed a turn of cloth allowance for the front facings. 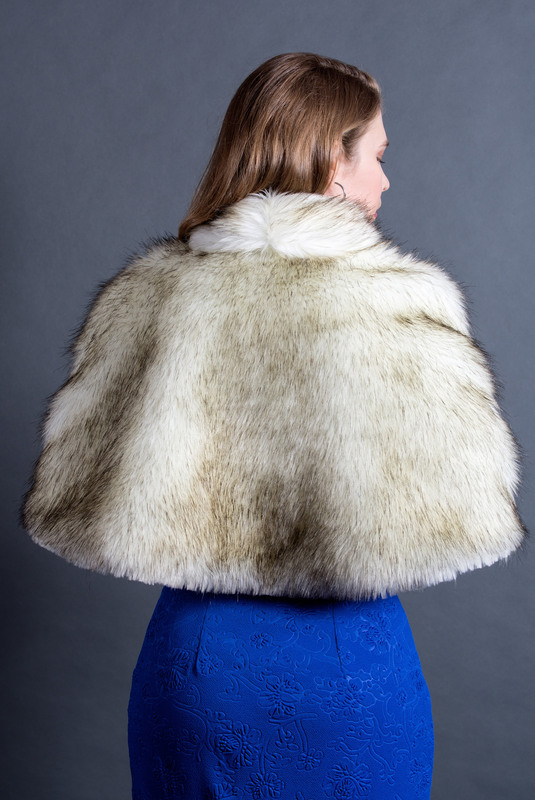 It is really supposed to be straight at the center front; in my case the sheer bulk of the fur fabric makes it turned slightly upward. Oops. 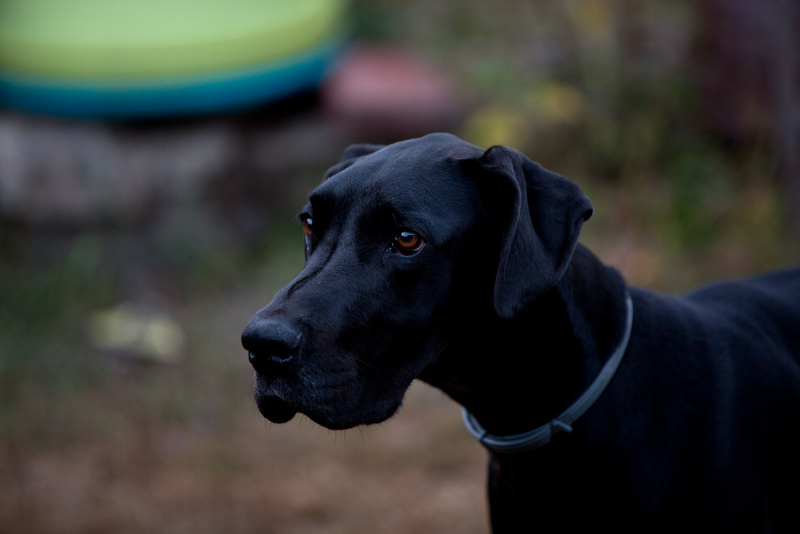 In other news…our baby girl (who is not so little anymore) turned two yesterday. She’s officially an “adult” Great Dane now. Happy birthday Sallie! This looks so luxurious and very glamorous. The lines from the back view (cape plus skirt) are so feminine and beautiful! Thanks! As much as I want to embrace the more androgynous styles of the past decade, I seem to do best when I stick to the more traditionally feminine looks. Your cape is so luxurious! I love it. It is hard to believe it cost me less than $30 to make! Definitely the glamour of the ’40’s. Bella is aptly named. 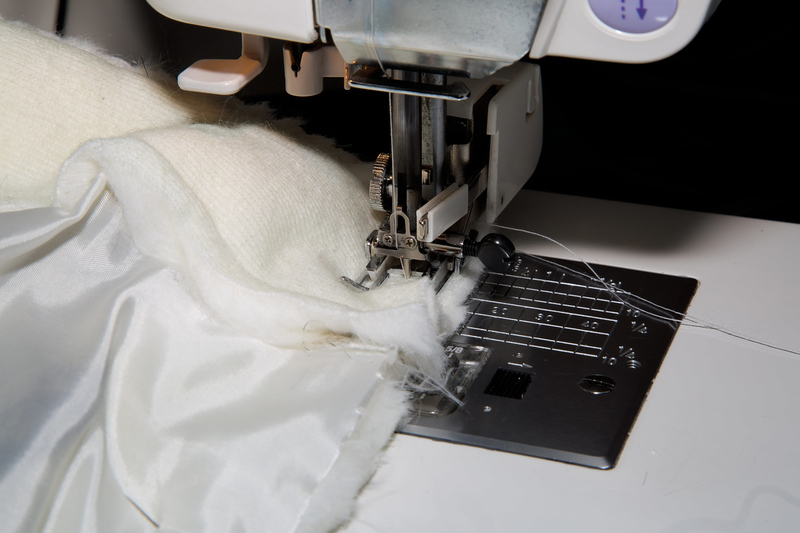 It makes sense from a practical standpoint – the collar would be way too bulky otherwise, and it would have also made sewing certain sections on a machine nearly impossible. Very lovely job; looks warm. Your photos look so professional. I need to re-read your tips on camera settings and lighting. I cut furs wrong side up with a craft knife cutting only the backing, not any of the hairs. It’s less messy than scissors. Good idea of using fabric for the under collar. I intended on just pushing the pile up along the hemline to avoid cutting into it…then the cats started fighting (lots of growling, chasing, literally fur flying) and after I broke that up I lost my train of thought and just started cutting. Oops!